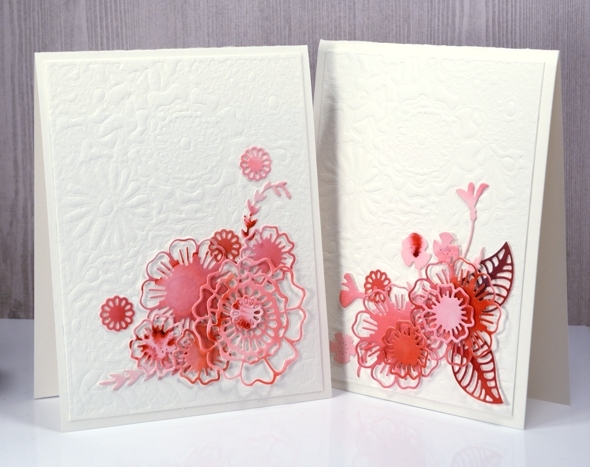 I have a couple of cards made using die cuts today but first the winner of last Monday’s giveaway from The Foiled Fox. Thank you to The Foiled Fox for the gift certificate and thank you to everyone who participated. I enjoyed reading what is on your wishlists. Congratulations Pansy47, I will email you with the details and you will need to pick a favorite or two! I came across a card recently with a completely embossed background like the one above. I was reminded that I can use my dies for embossing as well as cutting. After playing around with several dies I’ve decided the most impressive for this technique are the intricate ones that I don’t always reach for when cutting because of all the tiny pieces that have to be pressed out of the cardstock or die. As an embossed background I think it looks just like a matelasse quilt with all the quilting done on one colour fabric in the same colour thread. I added to my background a collection of flowers and leaves cut from a watercolour panel painted with scarlet brusho. If you haven’t embossed with your dies before just search ’embossing with dies’ to see how to do it with your particular die cut machine. To get a good impression I spritzed water on my watercolour paper first before putting it through the machine. These cards are so pretty!! 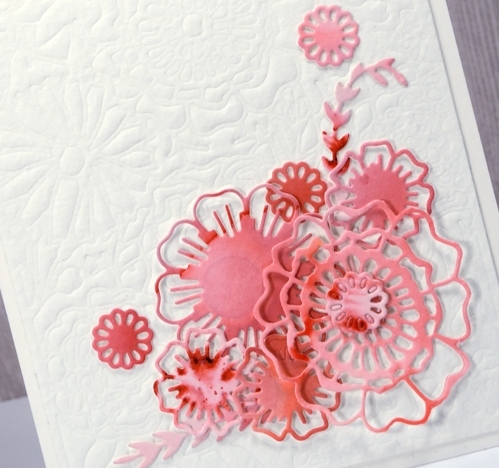 I need to use my embossing folders more – thank you so much! Congratulations to pansy47, enjoy your prize. These are two beautiful cards Heather. I find all the flowers and leaves die cut from the same coloured watercoloured panel so very elegant. Thank you. A perfect description for your background! Very pretty, feminine cards.